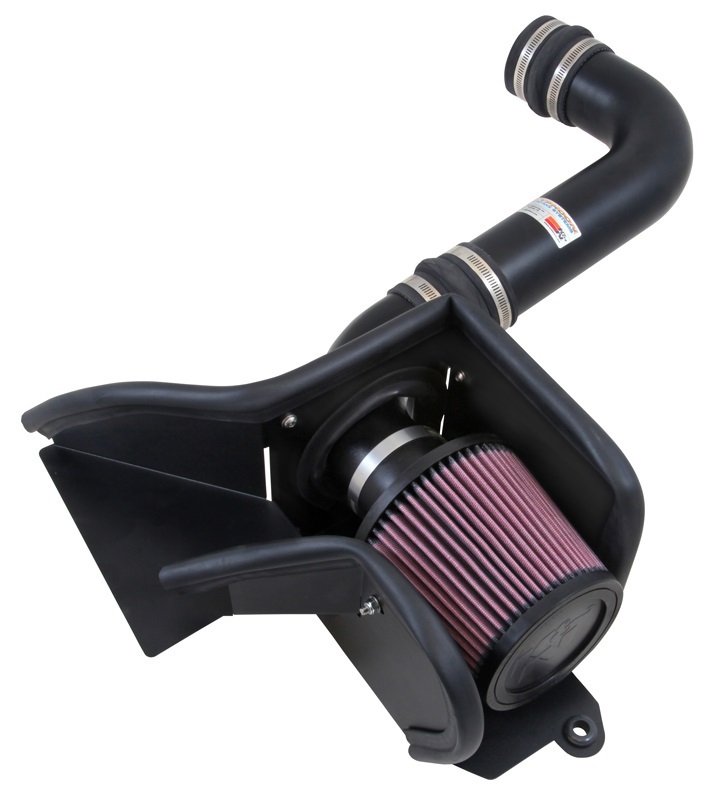 Built for performance and show, the Typhoon® Cold Air Intake System (CA) is a free-flowing mandrel bent aluminum tube induction system designed to increase horsepower and torque. The Typhoon® Cold Air Intake System comes with an oversized high-flow conical air filter designed to provide increased surface area that provides even more airflow at lower restriction than a standard K&N OE replacement air filter that is limited to the size of the factory air box. The oversize air filter also captures more dirt increasing the service life before a cleaning is required (up to 100,000 miles). K&N’s reusable, high-flow filters allow for high air flow and excellent filtration. Powder-coated steel brackets and silicone rubber mounts. Precision CNC machined billet aluminum adapters for accurate Mass airflow sensor readings. Drycharger provides added protection by repelling water from entering the intake system. Reinforced, silicone hoses for increased durability, tensile strength and temperature. CNC Mandrel-bent aluminum tubing for smooth straightened airflow. Guaranteed to Provide more horsepower and increased acceleration. Includes K&N High-Flow, Washable/Reusable Air Filter. Please be sure to check the compatibility list above and select the appropriate engine type from the drop down box next to the 'add to cart' button.